Most importantly, our dog walkers share our love for pets and our commitment to our clients. I’m originally from Fortaleza, Brazil, and currently living 4 years in NY. I grew up in the small city with my family. I had 2 dogs during my childhood. Then when I was young, we left that town and went to the big city to finish high school and college where I studied logistics assistance. My experience with dogs is just wonderful. I had Rauf as my first stray dog, and he was really my best friend. Laila was my second dog, she was a cute puddle and a very lovely girl. But my first professional experience walking dogs, is with NY Tails. I love my job! I currently only work at NY Tails. My main hobbies are playing video games and guitar. The best part of walking dogs is the love and kindness the dogs have for me. Especially when I’m going to pick them up. I feel they are part of my life. Claudia was born in Cuba, where she spent her first 24 years. Growing up, her family had a lot of pets and she was always around them, at one point they had 7 dogs, 4 cats and a turtle. 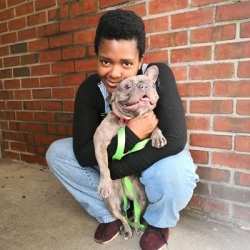 She has also rescued some dogs directly off the streets and nursed them back to good health. At 25, she moved to Argentina holding a degree in Accounting and Finance. However, once there, she decided to study Haute Couture and she’d spend the next decade living in Buenos Aires. Claudia moved to the States in 2016 to become more involved in the fashion industry and work on her English as well. Nowadays, in her off hours, Claudia works part time as an assistant to a fashion designer and takes English classes at night. She also enjoys spending time working on dresses and other designs, or making coats for her pup, Simon. George grew up in Trenton, NJ and moved to NYC in 2013 to pursue filmmaking. He majored in Digital Film at Mercer County Community College. Prior to NY Tails he freelanced in taking care of cats. Personally, he’s owned 7 cats and 5 dogs in his lifetime and has also watched over the birth and found homes for over 20 puppies. Currently he’s a freelance videographer on the side. George works with others to create pitches for their ideas and he also writes and shoots his own screenplays. 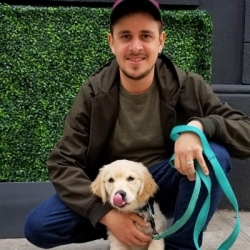 Greg’s love for dogs started at a young age when his family rescued a Greyhound pup in the small Massachusetts’s town where he grew up. Out of all his brothers, he was the one who bonded the most with the dog, taking him on walks around the neighborhood and almost everywhere else he went. When he got older, Greg moved to NYC and he’s been here for the past 6 years. Outside NY Tails, he’s a DJ for the Midnite Monster Hop at Otto’s Shrunken Head in Manhattan, which is also part of a 30s inspired horror show that projects movies and sketches. He’s an avid record collector as well. According to Greg, the best part of dog walking is the bond he develops with all dogs. “It’s always a joy and a good laugh with all of their unique personalities.” he says. I was born and raised in NY. 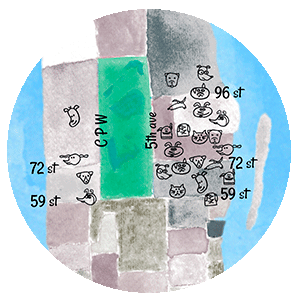 I moved to vaious parts of the city while growing up. I’ve lived in the Bronx, Brooklyn, Manhattan, and Queens at some point in my life. I’m currently attending college. I worked at daycares for 2 years before I started dog walking and voluteered at a animal shelter during my senior year of High School. I’m studying to become an engineer as of now in community college. My favorite part about working with dogs is that it is very uplifting and enjoyable. Whenever I don’t want to think about anything else it’s nice to go to work and be able to clear my head alongside a pup. My parents are from the Dominican Republic but I was born and raised here in NY, where I graduated from high school. I fell in love with animals from a very early age since my parents had a family dog and then a cat. My older siblings had pet pups and once I was old enough I got my own cat which eventually birthed 2 litters in my bedroom. I am currently working with Ny Tails and when I’m not working I am with family and friends. I like playing video games and sports especially basketball. I really love all kinds of music and produce beats in my free time. My favorite part about dog walking is having the ability to walk with your cute furry boss and having a fun adventure every time. 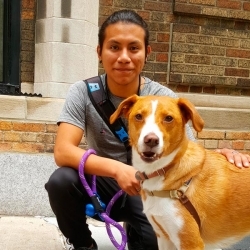 Lucas calls NYC home because even though he was born in Mexico, he was raised here. He graduated high school no too long ago and he hopes to continue his studies in the future. 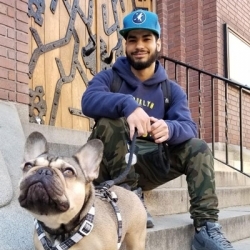 Before applying to NY Tails, Lucas had only had personal experience with his own two dogs but in the time he’s been working with the company and our team, he’s learned a lot from the training and guidance provided. In his free time, Lucas likes to relax and spend time with his family and his daughter. 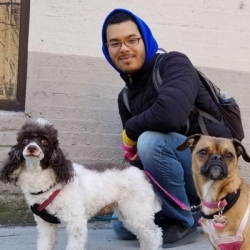 He’s currently a full time NY Tails team member and he’s always eager to help.”Working with pets is the best, I simply love them!” he says. To him, the best part of his day is that great feeling of being met at the door by the pups with a loving face and absolute excitement. “You can’t help but get attached”. Luciano is originally from Brazil and he’s been working with dogs since 2002, with almost 15 years experience in the industry. 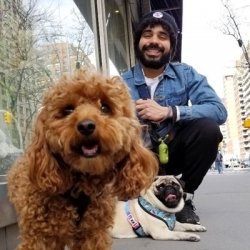 He was initially trained by and learned the job at the K-9 Club, one the first dog walking services in NYC, and spent almost 5 years working for them. 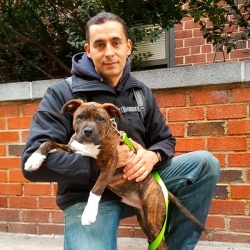 Afterwards, he worked independently until early 2013, when he joined our NY Tails team. As a hobby, Luciano likes to study auto mechanics and is constantly looking for new methods of maintaining auto equipment. 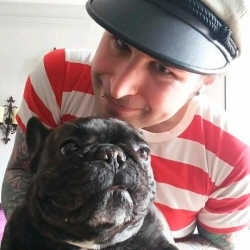 Growing up around dogs and cats, he has always loved them, and he thinks it makes for a great life having the chance to live among and being able to work with them. Originally from Ohio, Mally moved to NYC two years ago to pursue her place in the dance world! She has a BFA in Dance from Wright State University. Mally always was around dogs and cats growing up. When she got older, she started to “pet sit” if her family went out of town for the night, weekend, or week. In college, she also did some dog sitting for some of the faculty members. 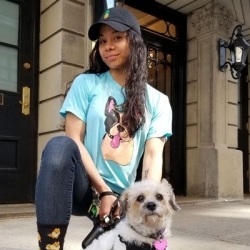 On the weekends, she goes to auditions and takes classes in various styles of dance such as ballet, modern, and street styles when she can squeeze them in. She loves choreographing and it’s her single greatest hobby. Mally’s other hobbies include books, movies, music. The classic three. I am from São Paulo, Brazil. I grew up in a big city with so many cultures and diversity, all living together and sharing the same space. I learned, and was raised, respecting my folks and people. Fortunately, I had parents who gave me the best education and I’m so thankful for it. I have a degree in economic science (2016) and came to NYC right after graduation. 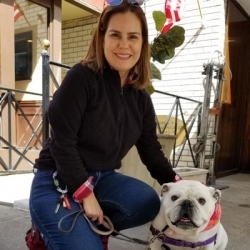 I can remember when I was little playing with my grandma’s dogs in her home and having the best time ever… I grew up around so many dogs in my neighborhood and always loved sharing moments with them. 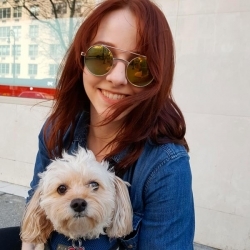 I also work as a financial analyst for a few clients in Brazil and have experiences in bartending here in the US… right now I’m spending more time working and studying with music (I’ve played instruments since I was 10). I love going dancing, spending time with my friends, skateboarding and surfing when it’s possible. 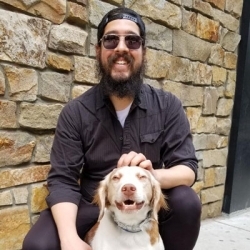 My favorite part about working with dogs is the connection between us… I’ve learned so much about loyalty and sharing love and how important it is for us to have a real relationship with someone… they teach me every day to be more patient and how to accept love. I’m a born and raised New Yorker. I studied Film and Media Production at Bronx Community College and Creative Writing at City College. My family had a lot of pets growing up. Dogs, cats, turtles, hamsters, and even a rabbit. I love animals and I’ve been around them my whole life. In my spare time I make short films and music videos with my friends. I also host a monthly movie night in Brooklyn. Once a month our club gathers and I curate a night of movies and drinks. The best part of dog walking, besides the exercise and enjoying nature, is making friends with so many dogs. My heart is warmed every time I pick up a dog and they’re excited to see me. I live in Brooklyn. People always mistake me for being Hispanic but I’m actually half Thai and Haitian. I graduated high school in June, 2014 then went to college. I’ve always loved being around animals but specifically dogs and cats. I ended up working at a group home for the elderly and disabled for 3 years, and also volunteered with the ASPCA from time to time. Growing up I’ve always had a love for dogs. In junior high school my friends and I would look through the book of dog breeds and learn about the different types of breeds. 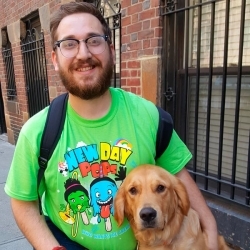 Since dogs weren’t allowed where I lived, at the age of 13, I started volunteering at the Sean Casey Animal Rescue in Brooklyn. I spent a lot of time interacting with many dogs and cats, helped out with dog walking, cleaning the kennels, and even had the chance to help out with some rescues. After 2 years of volunteering there, I decided to adopt a dog from the shelter and I’ve had her for 10 years now. She’s become my best friend and has helped me get through a lot of tough times. I also rescued a cat in front of my building two years later, after adopting my dog and he’s also become my best friend who’s very vocal and full of love. 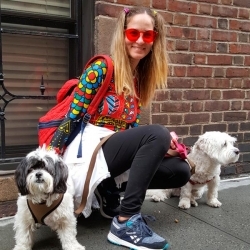 Right now I’m currently only working with NY tails but on my own time, I enjoy working out, practicing yoga, and spending time with my furry best friends. What I enjoy most about taking care of dogs and cats is learning about their beautiful personalities and creating memorable bonds each and every day. I was born in New York but my family is from the Dominican Republic. My mom and I had a Maltese for about 5 years and I also enjoyed walking my friend’s dog where I grew up. I don’t work anywhere else but I do plan on returning back to school. Education is very important to me. My favorite part about working and taking care of dogs is that they give unconditional love and affection and can turn your mood around. I’m originally from Brazil but I’ve been in New York for 9 years now. Everyone in my family is an animal lover, but dogs are our favorite for sure. I grew up with dogs and at one point we had 4 dogs in the house, as each member of my family had their own pup. My husband and I are motorcycle enthusiasts and we love to take long trips on our Harley. I have a degree in business, but when I moved to NY the opportunity of working with dogs presented itself and I took it right away. I’m very glad I did. It’s very rewarding to be around animals in general, but dogs make it especially rewarding as they give so much love and they are always there for you!